Neither blazing sun nor heatwaves nor droughts can stop our intrepid health wonks from opining and blogging. At Health System Ed blog, Peggy Salvatore hosts a great summer roundup of best-of posts: Health Wonk Review: The More Things Change, The More They Cost. Here’s a bit of a preview: Eye Selfies. Big Tobacco Abroad. Big Pharma. Something conspicuously absent from the first Republican debate. One of our wonkers on NPR. Personalized Medicine. There’s more, too – check it out. Also, you can follow more timely reports from our wonkers via this Health Wonk Review Twitter list. Twitter is super active in the areas of healthcare, workers comp, safety, insurance – even if you don’t think you want to Tweet yourself, signing up just to lurk and follow others can be very informative and often entertaining. Follow us on Twitter. In his remarks about the enforcement action against the company, Assistant Secretary of Labor for Occupational Safety and Health David Michaels took aim at the company’s reputation for safety. “DuPont promotes itself as having a ‘world-class safety’ culture and even markets its safety expertise to other employers, but these four preventable workplace deaths and the very serious hazards we uncovered at this facility are evidence of a failed safety program,” said Michaels. In a May interview with The Texas Tribune, Michaels called the initial $99,000 fine “petty cash” for the multibillion-dollar company and said he wished he could dole out harsher penalties. In reading accounts of the November chemical disaster, it’s apparent that this came very close to being much worse – not just for plant workers, but also the larger community. We call your attention to Up in the Tower, an excellent and eye-opening article in Texas Monthly by Lise Olsen that dissects the events leading up to and during the tragic November day. It lays bare many of the failures, warning signs and build up to the day’s events. By painting portraits of the deceased workers and their actions, it also puts a human face on the tragedy. DuPont experts continue to deliver lectures at global safety conferences and make millions peddling their safety programs to other companies, with results that they say have been proved. But the corporation’s pristine safety reputation suffered after toxic releases killed two workers at chemical complexes in New York and West Virginia. One longtime DuPont employee was fatally poisoned in 2010 after cheap plastic tubing burst inside a shed at DuPont’s plant in Belle, West Virginia, dousing him with phosgene, a gas that had been used as a chemical weapon in World War I. That same year, an explosion killed a contract welder and injured his co-worker in Buffalo, New York. They hadn’t been warned of a possible gas buildup inside the tank they were repairing. The U.S. Chemical Safety Board, a small federal agency that investigates the nation’s worst industrial chemical accidents, reviewed both cases and criticized DuPont. Company officials had failed to follow their own maintenance and safety rules, the board said. “In light of this, I would hope that DuPont officials are examining the safety culture company-wide,” the board’s former chairman John Bresland announced in July 2011. I was the carrier claims service representative for E. I. DuPont de Nemours from the late 80’s through most of the 90’s at both the Belle, WV plant, as well as, Waynesboro and Martinsville, VA. In the conduct of my responsibilities there, I became somewhat familiar and was impressed by the safety culture at these plants. It’s sad to see this strong emphasis on “Safety First” deteriorate to this point. I would hope that the pursuit of profit wasn’t a cause of this change in attitude, or the weakening of union influence on safety matters by collusion or desperation for jobs, but it’s hard to think of another explanation. Suzanne Lukas AKA “Evil HR Lady” posts 7 Myths About the Americans With Disabilities Act, deconstructing some of the common misunderstandings about the meaning and implementation of the law. Terri Rhodes posts about The Struggles of ADA Compliance at Risk & Insurance. HR Web Cafe posts about The ADA at 25 and the remarkable story of the “Capitol Crawl”, replete with videos documenting the event and people looking back at their participation. In what appears destined to be a classic in the “what not to do” department, Robin Shea posts about the court case that followed when an “Old fart” got fired at Employment & Labor Insider. It’s one case with many lessons! If your summertime vacations include any water sports, you might want to take a look at the Consumer Insurance Blog’s post and video about how drowning doesn’t look like what we see in the movies. The post notes that “We have wrong ideas about drowning and our ignorance means we don’t always recognize the signs of a person in distress when we see them.” This ignorance means that every year, children die in pools and water just feet away from parents or friends who do not recognize the signs of distress. 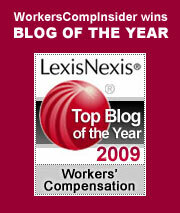 Lone workers continue to pose a risk challenge for workers comp. At WCI360, there’s a reprint of Tom Musick’s article from The National Safety Council August 2015 newsletter: Taking Steps to Ensure the Safety of People Who Work Alone. Ken Ward at Coal Tattoo reports on the latest case developments in the criminal trial against Don Blankenship: Why doesn’t Don Blankenship want the jury to hear about the Upper Big Branch Mine Disaster? Could OSHA use drones for safety inspections?